The Dutch were the first Europeans to settle the area on the western edge of Long Island, which was then largely inhabited by the Lenape, a Native American people. 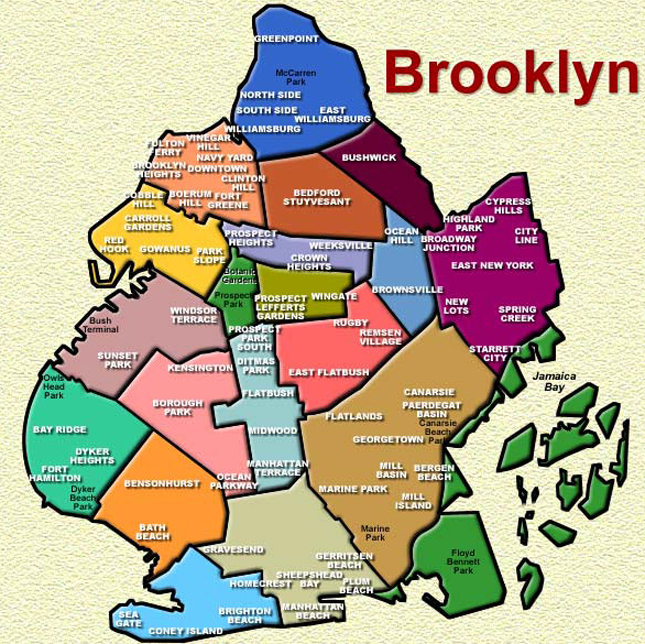 Brooklyn originated in the 17th century as a small Dutch-founded town of “Breuckelen”, named after a municipality of Breukelen, in the province of Utrecht, in the Netherlands. If separated from the rest of New York City, Brooklyn would become the 4th most populous U.S. city. Almost 40% of current Brooklynites are foreign born. The median age of a Brooklyn resident is 34.7 years. 44% percent of Brooklyn’s employed population, or almost half a million people, work in the borough; more than 50% of the borough’s residents work outside its boundaries. Jobs in the borough have traditionally been concentrated in manufacturing, but since 1975, Brooklyn has shifted from a manufacturing-based to a service-based economy. Brooklyn has 30 miles of waterfront. Famous people born in Brooklyn include Woody Allen, Barbra Streisand, Mos Def, Larry King, Eddie Murphy, Adam Sandler, Mike Tyson, Carmelo Anthony, Richard Dreyfuss, Arlo Guthrie, Pat Benatar, Norah Jones, Jean-Michel Basquiat, Steve Buscemi, Neil Diamond, Tony Danza, Alyssa Milano, Jimmy Fallon, Jackie Gleason, Spike Lee, Al Capone, and Jay-Z to name a few. Brighton Beach (“Little Russia”) is home to the largest concentration of Russian and Ukrainian immigrants in New York. Bedford-Stuyvesant is home to one of the most famous African American communities in the city, along with Brownsville, East New York, and Coney Island. “Bed-Stuy” is a hub for African American culture, often referenced in hip hop and African American arts. Originally, it was called Weeksville and served as a refuge for many African-Americans who fled from Manhattan during the violent Draft Riot of 1863. The current official colors of Brooklyn are blue and gold. No one really knows for sure what they signify, except that they are also a part of the Brooklyn flag. 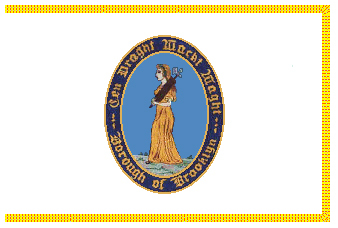 The flag also contains the Brooklyn motto: “Eendraght Maeckt Maght” (Dutch), which means: “In unity, there is strength.” The motto is displayed on the borough seal, which also features a young robed woman bearing fasces (a bound bundle of wooden rods with an axe), a traditional emblem of unity and Republicanism. On August 27, 1776, the Battle of Long Island (also known as the Battle of Brooklyn) was the first major engagement fought in the American Revolutionary War after independence was declared, and the largest of the entire conflict. British troops forced Continental Army troops under George Washington off the heights near the modern sites of Green-Wood Cemetery, Prospect Park, and Grand Army Plaza. Washington, viewing particularly fierce fighting at the Gowanus Creek from his vantage point atop a hill near the west end of present-day Atlantic Avenue, was famously reported to have emotionally exclaimed: “What brave men I must this day lose!”. First established as a shipbuilding facility in 1801, the Brooklyn Navy Yard employed 70,000 people at its peak during World War II and was then the largest employer in the borough. The Missouri, the ship on which the Japanese formally surrendered, was built there, as was the Maine, whose sinking off Havana led to the start of the Spanish–American War. The iron-sided Civil War vessel the Monitor was built in Greenpoint. The pharmaceutical company Pfizer was founded in Brooklyn in 1869 and had a manufacturing plant in the borough for many years that once employed thousands of workers. The plant shut down in 2008. The original Nathan’s also known as Nathan’s Famous, originally opened in 1916 as a nameless hot dog stand on the corner of Surf and Stillwell Avenues in Coney Island by a Polish immigrant Nathan Handwerker. Handwerker decided to call his hot dog stand Nathan’s Famous in 1921 after hearing the song, “Nathan, Nathan Why You Waitin?” by Sophie Tucker playing from a nearby restaurant. The Brooklyn Museum, opened in 1897, is New York City’s second-largest public art museum. It has in its permanent collection more than 1.5 million objects. The Brooklyn Children’s Museum, the world’s first museum dedicated to children, opened in December 1899. The Brooklyn Academy of Music (BAM) includes a 2,109-seat opera house, a 874-seat theater, and the art house BAM Rose Cinemas. Brooklyn Technical High School has the second-largest auditorium in New York City (after Radio City Music Hall), with a seating capacity of over 3,000. Brooklyn Botanic Garden: located adjacent to Prospect Park is the 52-acre (21 ha) botanical garden, which includes a cherry tree esplanade, a one-acre rose garden, a Japanese hill and pond garden, a fragrance garden, a water lily pond esplanade, several conservatories, a rock garden, a native flora garden, a bonsai tree collection, and children’s gardens and discovery exhibits. Coney Island developed as a playground for the rich in the early 1900s, but it grew as one of America’s first amusement grounds and attracted crowds from all over New York. The Cyclone rollercoaster, built in 1927, is on the National Register of Historic Places. The 1920 Wonder Wheel and other rides are still operational at Astroland. Coney Island went into decline in the 1970s, but is currently undergoing a renaissance: the new Luna Park opened in 2010. Floyd Bennett Field was the first municipal airport in New York City. It is now part of the National Park System. Many of the historic hangars and runways are still extant. Green-Wood Cemetery, founded by the social reformer Henry Evelyn Pierrepont in 1838, is both one of the most significant cemeteries in the United States and an expansive green space encompassing 478 acres (190 ha) of rolling hills and dales, several ponds, and a baroque chapel. Still in use, the cemetery is the burial ground of many notable New Yorkers. Prospect Park is a public park in central Brooklyn encompassing 585 acres (2.37 km2). The park was designed by Frederick Law Olmsted and Calvert Vaux, who created Manhattan’s Central Park. When asked which park he preferred, Olmsted said his Brooklyn creation was the nicer of the two. Brooklyn College is a senior college of the City University of New York, and was the first public coeducational liberal arts college in New York City. SUNY Downstate Medical Center, originally founded as the Long Island College Hospital in 1860, is the oldest hospital-based medical school in the United States. Pratt Institute, in Clinton Hill, is recognized by U.S. News and World Report as being one of the top 20 colleges in the Regional Universities North category. Pratt is a private college founded in 1887 with programs in engineering, architecture, and the arts. Brooklyn’s major professional sports team is the NBA’s Brooklyn Nets. The Nets moved into the borough in 2012 and play their home games at Barclays Center in Prospect Heights. Brooklyn’s most famous historical team, the Brooklyn Dodgers, named for “trolley dodgers” played at Ebbets Field. In 1947 Jackie Robinson was hired by the Dodgers as the first African-American player in Major League Baseball in the modern era. The Dodgers moved to Los Angeles in 1958. After a 43-year hiatus, professional baseball returned to the borough in 2001 with the Brooklyn Cyclones, a minor league team that plays in MCU Park in Coney Island. They are an affiliate of the New York Mets. The Brooklyn based Topps company dumped 500 cases of their 1952 high series baseball cards into the ocean just off the Jersey shore in the early 60s, just because they were not saying too well at the time. Current value of the cards, which included rare Mickey Mantle collector gems, would be well over $1 Billion. The cinematographic classic Saturday Night Fever, starring John Travolta was mainly filmed in the Bay Ridge and Bensonhurst neighborhoods of Brooklyn.